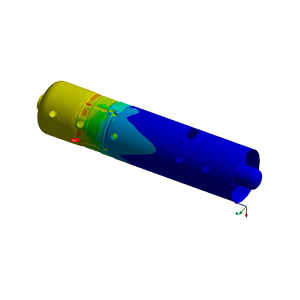 FEA-Solutions (UK) Ltd - Finite Element Analysis For Your Product Design | 625: Weld Overlay Repair Simulation of a weld overlay repair of a big process vessel. The cooling and shrinkage of the weld filler material causes stresses and deformations. The analysis resulted in recommendations on how to improve the location and sizes of the weld patches to minimise distortion. Simulation of a weld overlay repair of a big process vessel. The cooling and shrinkage of the weld filler material causes stresses and deformations. The analysis resulted in recommendations on how to improve the location and sizes of the weld patches to minimise distortion.